They are doctor Quynh Kieu (Vietnamese American), professor Thai Thi Kim Lan (Vietnamese German), painter Van Duong Thanh (Vietnamese Swedish) and engineer Do Anh Thu (Vietnamese American). Ms Quynh Kieu was not present at the awards ceremony of the Vietnam Glory 2006 because she was busy in a central <?xml:namespace prefix = st1 ns = "urn:schemas-microsoft-com:office:smarttags" />province of Vietnam examining and performing operations on poor children and women with 120 volunteers of the Project Vietnam charity organisation. Since 1997, Project Vietnam’s mission led by doctor Quynh Kieu has provided free check-ups and operations for needy children and women in rural and remote areas of Vietnam. Doctor Quynh Kieu is the first and the only Vietnamese doctor to receive the outstanding woman award given by the state of California. With “Project Vietnam”, she and three American doctors were presented with the Medical Honour award by the American Medical Society in 2004 for their dedicated and outstanding service for people who need help. Professor Thai Thi Kim Lan graduated from Hue University’s Philosophy Faculty in 1964. She went to Germany for further study in 1965. In 1976, she completed her German philosophy doctorate thesis at Munich University, and became a lecturer at the university. In 1980 she won the award for best non-native writer at Munich University. She is the editor of the German-Vietnamese literary collection and the translator of many books from Vietnamese into German and vice versa. She also won the Dao Tan prize in 2005 for her contributions to traditional art and culture. Van Duong Thanh is the youngest painter whose painting has been bought for display at the Vietnam Art Museum: "White daisy", which she painted at the age of 20. Ms Thanh’s "Vietnam ancient village" and "The quietness" were selected by French and American jurymen as the best paintings at the “Preeminent international art programme” in 1975 and 1977, the event that attracted artists from 36 countries. Painter Thanh now travels between Sweden and Vietnam. She is also an art lecturer at some universities in Sweden. Her paintings are loved everywhere and a group of fans of Van Duong Thanh’s paintings has been established, called Thanh-Gruppen. Van Duong Thanh is considered the ‘ambassador’ of Vietnamese culture in Sweden for her efforts to strengthen the relationship between the two countries. Do Anh Thu graduated from the HCM City Teacher Training College and came to the US in 1979 to study at California University. She is the founder and the first chairwoman of the Vietnamese Students’ Association at the Contra Costa and Berkeley campuses. She graduated from the Computing Faculty at Berkeley in 1984. After that she worked for big corporations like Motorola, Fortune Systems, Cygnet Systems and Sun Microsystems. In 1991 she was the co-founder of the VNHELP, a non-government charity organisation that initiates projects to help Vietnam in the fields of health, education and culture. VNHELP is considered the oldest charity organisation of Vietnamese in the US. 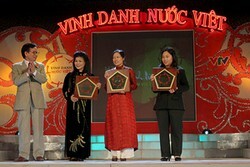 She returned to Vietnam in 1993 to directly monitor projects of VNHELP in Vietnam. She won the most outstanding Asian American award of the ABC North California channel in 2003. She was also awarded the title, “Woman of social activities”, by the Women’s Fund in Silicon Valley, California. In 2005 she stopped working as an engineer to focus her efforts on charity activities.